Our final Elves review for the time being is a big one, both in size and in the number of new recolours! Scott Barnick gets lost in the treetops. 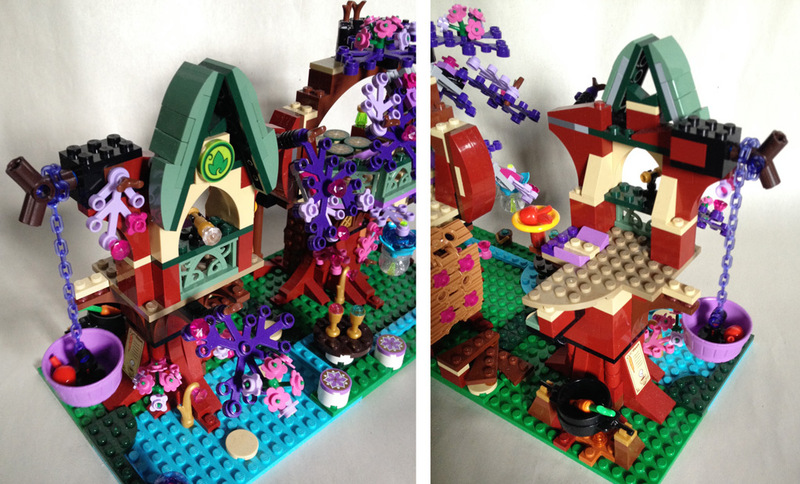 41075 The Elves’ Treetop Hideaway is where Emily Jones’s adventure in Elvendale begins. Unlike 41073 Naida’s Epic Adventure Ship which I reviewed previously, this set is more focused on slice-of-life play than adventure play. However, it still gives a great taste of how strange and magical this new world is. 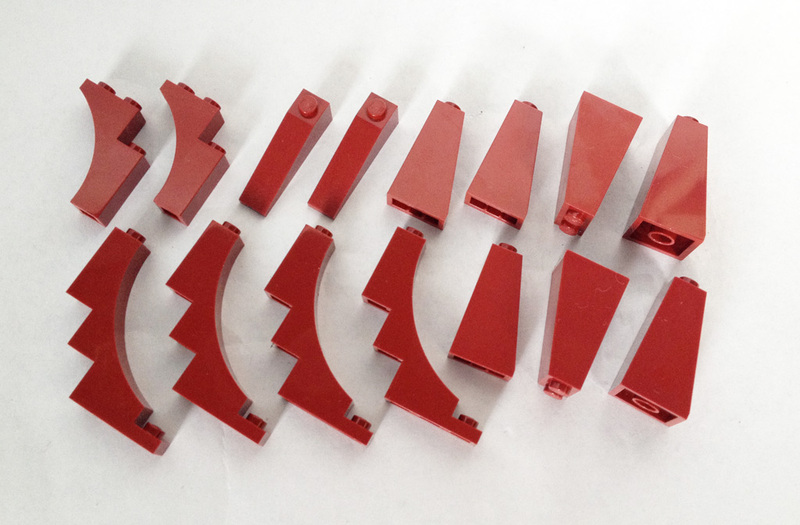 Fittingly, it includes lots of new parts in quite an exotic selection of colors! Without further ado, let’s take a look! 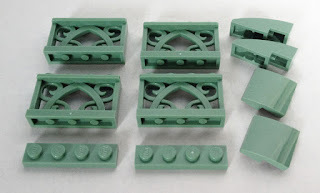 The set contains a handful of new and rare parts in Sand Green: four of the new 1x4x2 fence elements (Design ID 19121 | Element ID 6097680), two 1x3 bricks with bow (Design ID 50950 | Element ID 6100237), and two 2x2x⅔ plates with bow (Design ID 15068 | Element ID 6080431). The last of these has also appeared in 70747 Boulder Blaster from LEGO Ninjago and 75060 Slave I from LEGO Star Wars, but all three are new elements for this year. There are also several rare Earth Green [TLG] | Dark Green [BL] parts in this set: two 1x4/2x2 hinge plates (Design ID 19954 | Element ID 6102779), three 1x3 plates (Design ID 3623 | Element ID 6013975), four 3x3 curved plates (Design ID 30357 | Element ID 6001836), and four 2x2 round tiles (Design ID 14769 | Element ID 6092771). These four round tiles are the cushions of Farran’s sofa bed, and are all stickered in the final set. The trunks and roots of the trees include an assortment of new or rare parts in New Dark Red [TLG]/Dark Red [BL]. Specifically, this set has two 1x3x3 arch bricks (Design ID 13965 | Element ID 6097517), four 1x5x4 inverted arch bricks (Design ID 30099 | Element ID 6097521), two 1x4x1 roof tiles (Design ID 60477 | Element ID 6023330), and four 2x2x3 roof tiles (Design ID 98560 | Element ID 6007898). Two of these 2x2x3 roof tiles will be stickered during the course of the build, but due to their scarcity I know many builders might choose not to sticker them. 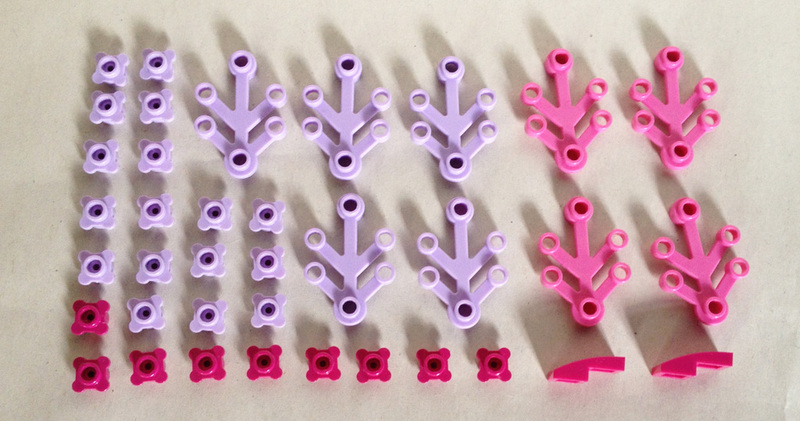 Like many of the Elves sets, this set also has several new or rare parts in various shades of pink and purple. In Medium Lilac [TLG]/Dark Purple [BL] it has seven 5x6 limb elements (Design ID 2417 | Element ID 6097523) and three 1x3 plates (Design ID 3623 | Element ID 6035470). The former is exclusive to the Elves theme, while the latter is older but has only appeared in four other sets. In Medium Lavender this set includes two 4M 45-degree angle plates (Design ID 15706 | Element ID 6074919), previously exclusive to 41058 Heartlake Shopping Mall, and a wooden washtub (Design ID 64951 | Element ID 4651908), which appeared in just two Friends sets last year. In Lavender the set contains 14 (plus three extra) four-petal flowers (Design ID 33291 | Element ID 6074906) and five 3x4 limb elements (Design ID 2423 | Element ID 6093902). 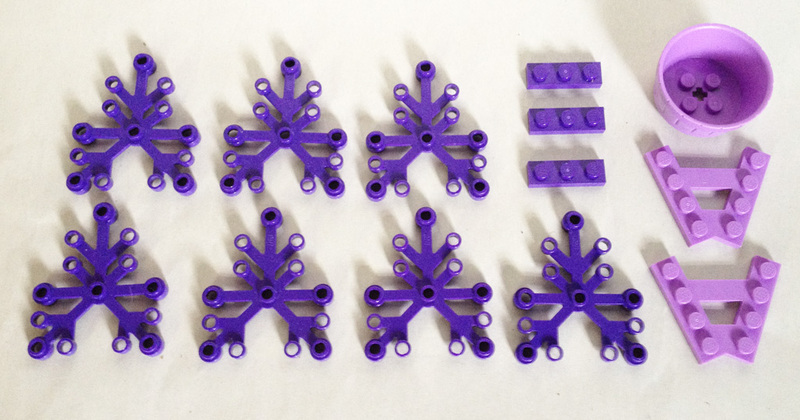 And in Bright Purple [TLG]/Dark Pink [BL], the set includes four 3x4 limb elements (Design ID 2423 | Element ID 6093902). Finally, the set includes two Bright Reddish Violet [TLG]/Magenta [BL] 1x2x⅔ bow plates and 7 (plus two extra) four-petal flowers (Design ID 33291 | Element ID 6078932). All of these are brand-new recolors for this year. Not everything in this set is brightly colored, though. 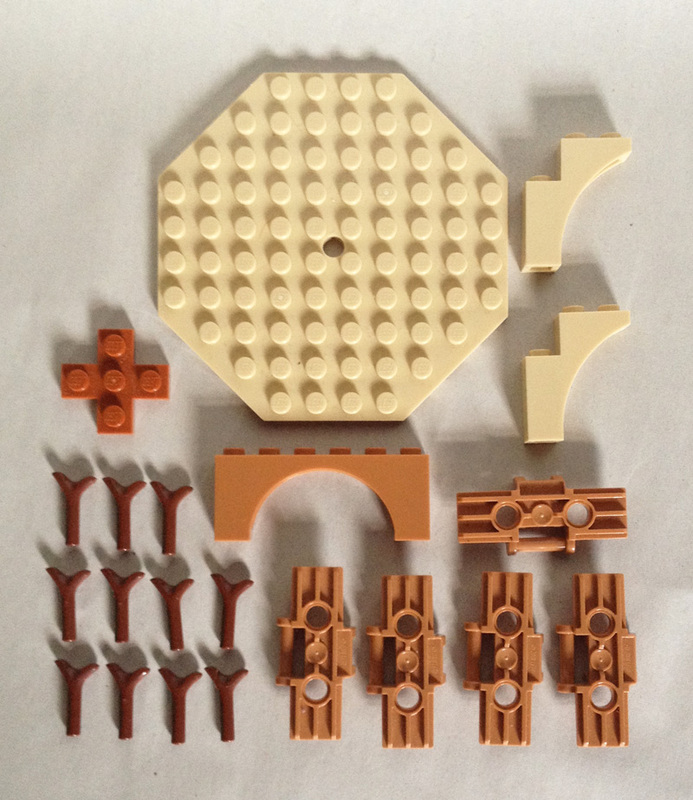 The set has a number of rare parts in various “earth tones”. The fire pit includes a rare 3x3 cross plate in Dark Orange (Design ID 15397 | Element ID 6062215). 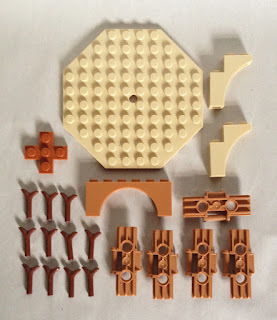 In Brick Yellow [TLG]/Tan [BL] the set includes two 1x3x3 arch bricks (Design ID 13965 | Element ID 6058093), a staple of the Elves sets, and a 10x10 octagonal plate (Design ID 89523 | Element ID 6037610). 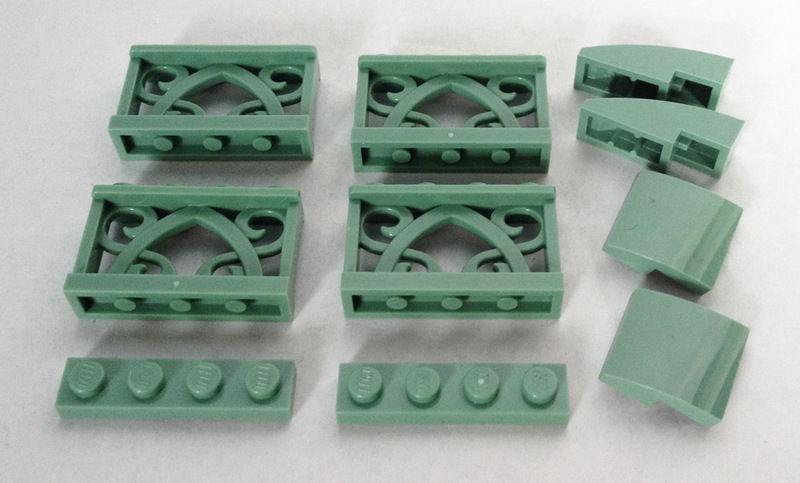 In Medium Nougat [TLG]/Medium Dark Flesh [BL], the set includes five brand-new 5x1½ Technic track elements (Design ID 88323 | Element ID 6097524) and a rare 1x6x2 arch brick (Design ID 15254 | Element ID 6106193). 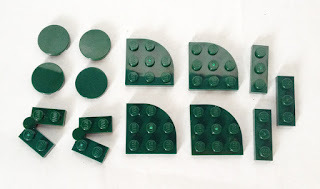 And in Reddish Brown the set includes seven (eleven, counting extras) carrot tops (Design ID 33183 | Element ID 607860), and two rare 1x12x3 arch bricks (Design ID 18838 | Element ID 6096379). 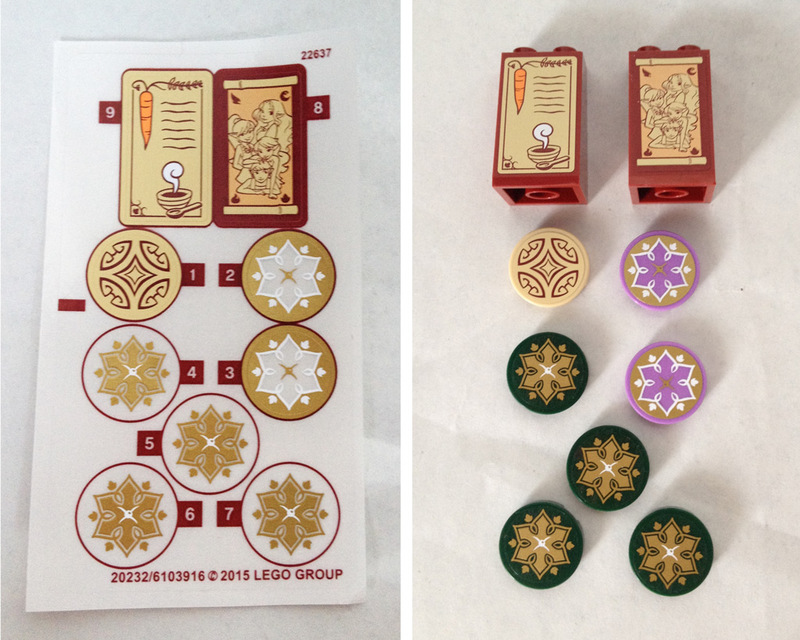 Not counting figures and animals, there are two new printed elements in this set: the Tr. Light Blue 4x4 radar dish (Design ID 20939 | Element ID 6110077) representing the magical portal, and the Bright Yellowish Green [TLG]/Lime [BL] 2x2 round tile (Design ID 20299 | Element ID 6104413) printed with an Earth elemental icon. Both are currently exclusive to this set, though the 2x2 round tile will also appear in both of the new Elves sets coming out this summer. There are also a few other stylish transparent elements in the set. In Tr. 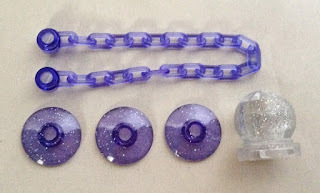 Bright Bluish Violet [TLG]/Trans-Purple [BL] a 16-module chain (Design ID 60169 | Element ID 6097525) appears exclusively in this set. In Tr. Bright Bluish Violet with Glitter [TLG]/Glitter Trans-Purple [BL] the set includes four 2x2 radar dishes (Design ID 30063 | Element ID 6093752), which also appear in 41074 Azari and the Magical Bakery And in Transparent with Glitter [TLG]/Glitter Trans-Clear [BL], the set includes a 2x2 crystal ball (Design ID 30106 | Element ID 6093747), which is otherwise exclusive to 41063 Ariel’s Undersea Palace . Finally, the set includes a rare black 4x4 frame plate (Design ID 64799 | Element ID 6058118), which has only appeared twice previously in the Juniors and LEGO Movie sets, two Warm Gold [TLG]/Pearl Gold [BL] reeds (Design ID 15279 | Element ID 6097518), and two Warm Gold 1x1 plates with upright clips in the new style (Design ID 15712 | Element ID 6071259). And let’s not forget the new Dark Green [TLG]/Green [BL] flower stem element (Design ID 19119 | Element ID 6097232)! This set has four of those, more than 41076 Farran and the Crystal Hollow but fewer than the new 10247 Ferris Wheel , which includes ten of them! The sticker sheet in this set includes nine stickers: six ornate circular cushions, an ornate circular pattern to mark a hiding place in one of the trees, and two rectangular scrolls: one with a soup recipe, which will hang next to the fire pit, and one with a portrait of the four elf friends, which will hang in Farran’s bedroom. These two scrolls and four of the cushions go on rare parts I’ve mentioned previously. 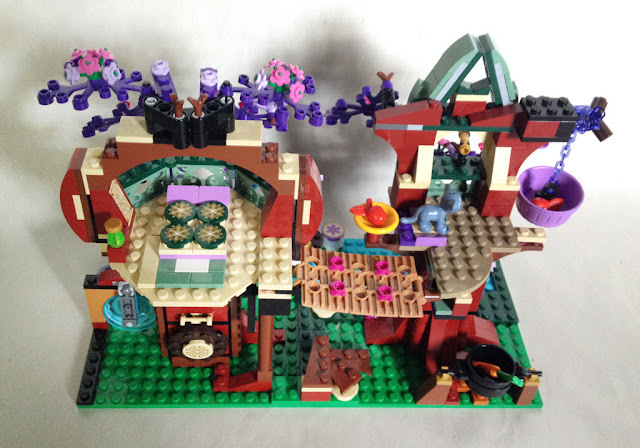 My brother has already discussed the Farran Leafshade and Azari Firedancer mini-dolls in his reviews of 41074 Azari and the Magical Bakery and 41076 Farran and the Crystal Hollow, but this set offers another option to get them, albeit without the corresponding magical keys. 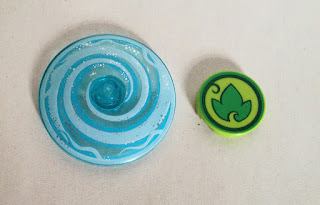 Each of them carries a transparent 1x1 round tile to represent their elemental magic. I like both of these figures, although I wish that Azari’s belt had been printed with metallic gold ink, since her torso seems a bit plain with just two colors of printing and no metallic accents. On another-note, the bottoms of Farran’s shoes are the same Light Nougat [TLG]/Light Flesh [BL] as his skin. It’s not a huge issue, but he’s the only one of the Elves with this issue — the others all have colored soles. Currently exclusive to this set are Emily Jones and Enki the panther cub. Emily is the theme’s main character, an interloper from the human world who needs help from her new elf friends to get back home. Compared to the elves, however, her outfit is very modern, with Bright Yellow sneakers, a striped tank top, and Sand Blue jean shorts. A nice detail of her design is her medallion, which she inherits from her late grandmother at the start of the story. Emily is equipped with an unprinted Sand Blue backpack (Design ID 11245 | Element ID 6106043). She will also appear with a new cape in 41078 Skyra’s Mysterious Sky Castle, which is due for release this August. 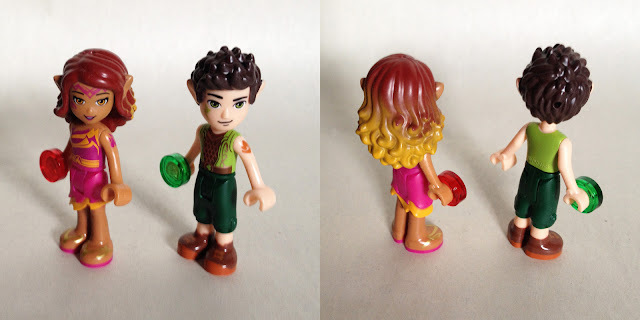 Enki is Farran’s pet panther cub, though it did not appear at all in the LEGO Elves TV special “Unite the Magic”. It shares a name with an island in the Izdur Ocean, so perhaps that’s where it hails from. Its forehead is printed with an Earth elemental icon and other decorations, identifying it as a creature of Elvendale. The same mold has previously been used for lion and tiger cubs in the LEGO Friends and LEGO Disney Princess themes, but this is its first appearance in Sand Blue. 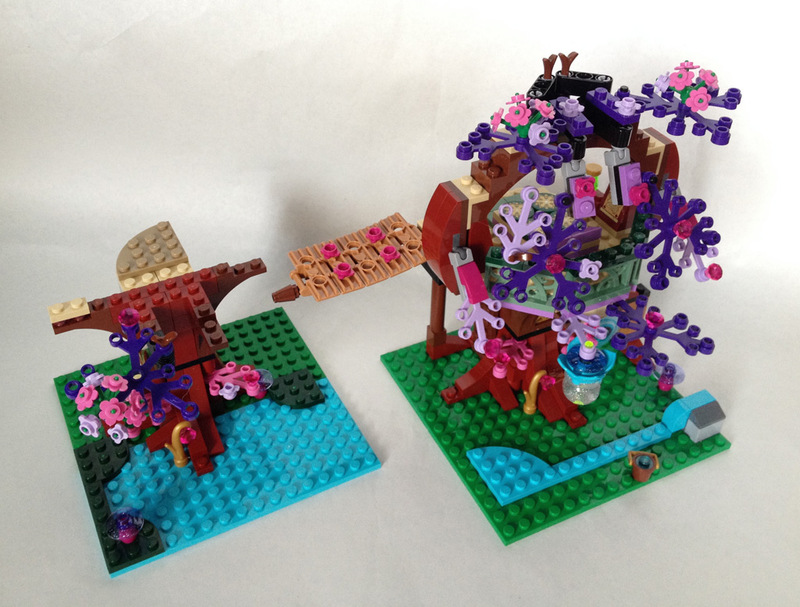 Bag 1 builds Azari, the outdoor furniture, the portal, and the base and trunk of the larger tree. Enki is also included in this first bag of parts. The outdoor furniture is not added to the base until the very end of the build. Bag 2 builds Emily Jones and adds the canopy to the larger tree, including Farran’s room, the magic ladder bridge function, and the leaf curtain function. This bag effectively doubles the height of the tree. 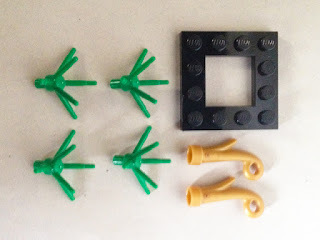 Bag 3 builds Farran, adds furniture to Farran’s room, and builds the base and trunk of the smaller tree (doubling the width of the set’s footprint). However, the bases are not joined together until much closer to the end of the build. Bag 4 builds the campfire and the canopy of the smaller tree, including Enki’s bed and food dish and the winch function to bring food up the tree. The bases of the two trees are also linked together in this stage, which involves adding some additional landscaping like the stepping-stones across the pond and the curved staircase leading up to the ladder. The table and chairs from Bag 1 are also attached to the base at this point. Let’s take a look at the finished set, starting with the portal. In the TV special, the portal is inside a hollow tree, but here it is placed beside the tree. This is just as well, as it would be difficult to access the back of it if it were fully enclosed. 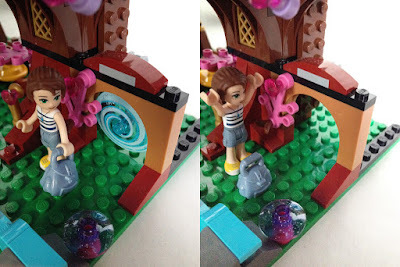 The portal itself connects to the arch above it by some joints from the Mixels sets. Raising it up not only lets Emily through but also lets it “wink” out of existence after she gets through — there wouldn’t be much of an adventure if she could just return to her world the same way she came! One regret I have about the portal is that there is no easy way to “spin” it, which I think would help it feel even more magical. The portal is able to rotate, but the pivot point is a stiff ball cup and there’s no easy way to grip the portal itself when it’s folded down. Directly outside the portal is a rock with a spring bubbling out of it. This is what feeds into the pond on the other side of the set’s base. A pail lets the elves gather fresh water from the spring, either for drinking or for making carrot soup. Speaking of drinking, the water from the spring flows right past a little table with two golden goblets, so Emily can share a drink with her new elf friends. One goblet seems to have just fresh water; the other has some fruity-looking pink concoction like the goblet from the Adventure Ship. Maybe it’s some type of crystal-berry juice that the elves harvest from the pink and purple trees. The seats at the table have nice cushions, but they don’t feel as organic as the seats at the table in front of the Magical Bakery. Perhaps they’re made from rocks or mushrooms? However, the three sparkly mushrooms in this set have Bright Reddish Violet stems instead of white ones like the mushrooms from the Magical Bakery. A glittering light fixture hangs from the branches of the tree above — perhaps a naturally bioluminescent flower of some sort. The leaves at the base of the trees are Bright Purple instead of Lavender or Medium Lilac, which gives the trees a nice layered effect — the more subdued leaf colors of the canopy resemble old growth, while the brighter leaf colors near the base resemble new growth. The use of Dark Red and Reddish Brown for the trunks of the trees also adds a lot of life and color. One design decision I question is that the space behind the window frame in this tree trunk is completely unused. Continuing across the stepping-stones brings us to the tree where Enki the panther cub lives. 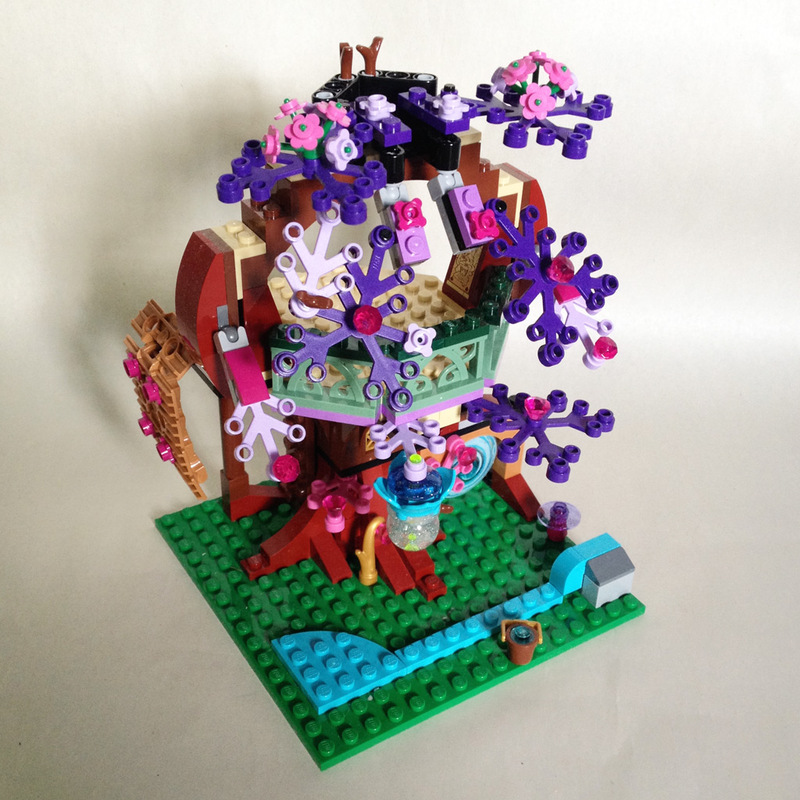 This tree has a smaller canopy than the other tree but makes up for it with a treehouse with a peaked roof. The window of Enki’s room features a spyglass for peering down at visitors below. It’s not as large as the spyglass on the quarterdeck of Naida’s Epic Adventure Ship, but that makes sense since it isn’t necessary for gazing such a great distance. On another note, the Sand Green peaked roof over this window is my brother Andrew’s favorite one in the theme so far. It fits together very securely, with no gap at the top. And it has a little bit more depth to it than the peaked roof façades from other sets. The Medium Lilac leaves of this tree attach by Technic click hinges, so your control over their angle is a bit limited. The bucket lift can be used to bring apples, carrots, or Enki the panther cub up and down the tree. It’s a bit peculiar that the chain on the bucket is purple, since that’s a color you might more readily associate with a wind elf like Aira Windwhistler, but since Farran’s earth powers include control over plants and most of the trees in Elvendale are purple, I suppose it’s still thematically appropriate. Down at the base of this tree is a campfire. A recipe for carrot soup is attached to the base of the tree as a sticker. Wouldn’t you know it; the chief ingredient is carrots! I suppose Azari the fire elf can stoke the fire as Farran cooks. Some people have questioned the logic of having a campfire so close to the base of a tree, but the fire is small and having a fire elf handy probably helps to keep it controlled. I can’t so easily explain away the illogic of a panther cub subsisting on apples, though! And that’s clearly the impression we’re meant to get, since the instructions ask you to place an apple in Enki’s food dish. A cushion next to his food dish gives him a place to relax, and there’s also enough floor space for him to run around or for the Elves to visit. 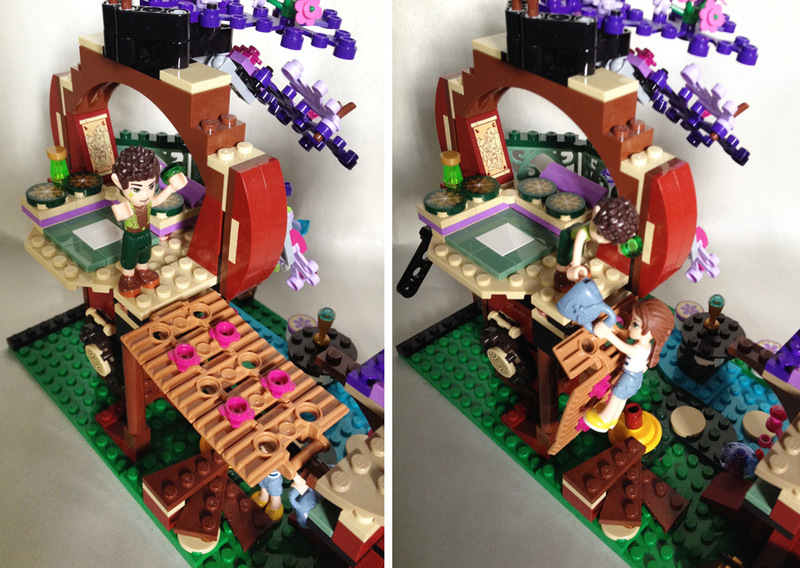 Emily and the elves can climb up and down the tree using the magic ladder bridge. As a ladder, it connects to a small spiral stair at the base of the tree. The mini-dolls can grip it by the Bright Reddish Violet flowers that decorate it, but it’s rather tricky and it’s easier to just guide them up to Farran’s bedroom with a little “Hand of God” intervention. A switch on the back of the larger tree can then convert the ladder back into a bridge to allow access to Enki’s room. 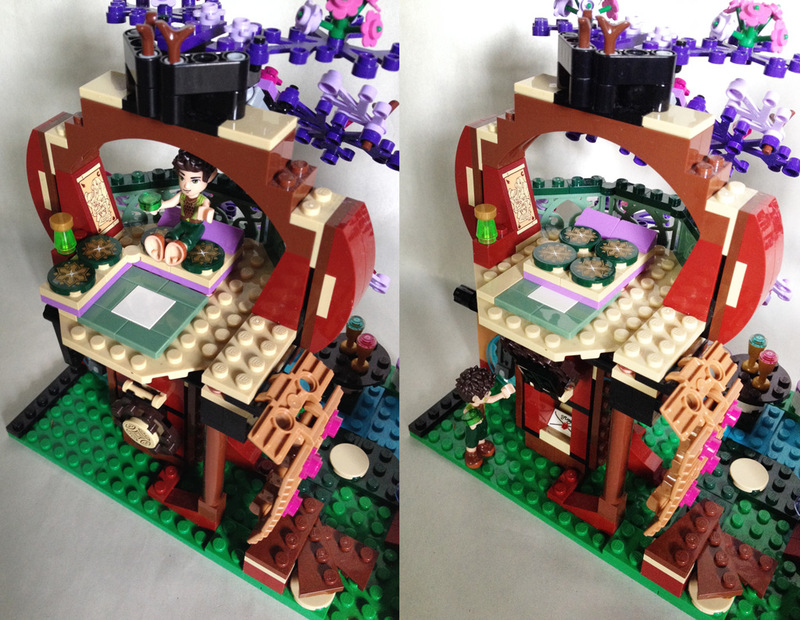 This function works more or less the same as the collapsing bridge in 70753 Lava Falls from this year’s Ninjago range. At the base of the tree where Farran lives, there is a secret compartment where he keeps letters from Aira the wind elf. It’s pretty roomy, so other trinkets and treasures could easily be hidden there as well. However, as I mentioned before, there’s a hollow space above this compartment that is more or less wasted. If the two spaces had been connected it would be easy for Pluma the bird from 41071 Aira’s Creative Workshop to drop letters into the window on the other side of the tree, so this secret compartment could function as a sort of mailbox. Farran’s room is nice and spacious. Its focal point is Farran’s sofa-bed, which converts from a bed to a sectional sofa with a hinge plate in the center. It sits on top of a nice white and green rug. The four circular cushions are very similar to the ones out front, and look very plush. Farran also has a side table with a mysterious Transparent Bright Green jar or bottle, and beside it, a wall scroll of him with his three elf friends! I always love heartwarming details like this, though as I mentioned when discussing the parts, some people might opt not to apply the sticker to the relatively rare 2x2x3 roof tile. Farran’s room also includes a wide balcony with a decorative railing. The leaf curtains around this balcony can be closed or opened with a simple Technic function on the top of the tree. The movement is not completely controlled, but I actually think that’s nice as it allows the leaves to rustle a bit as they move from side to side. Many of the leaves on this part of the tree are attached to more joints from the Mixels theme, so the angle can be freely adjusted. 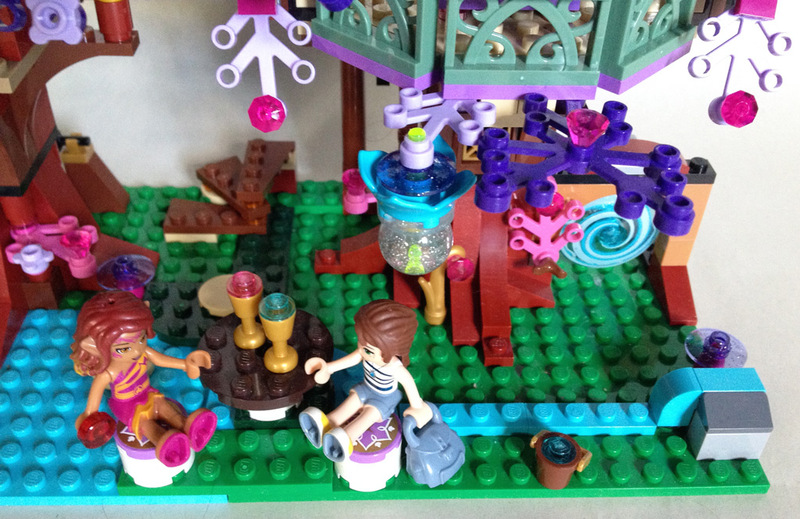 Overall, a lot of the magic in the LEGO Elves sets comes from their “secret” play features — hiding spaces, things that convert to other things, etcetera. And this set is packed with these sorts of magical features, from its leaf curtains to its magic ladder bridge to Farran’s sofa-bed. Despite the set being fairly compact (its footprint is just 16x32 modules / 5x10 inches / 12.8x25.6 centimeters), it manages to include a LOT of play value. 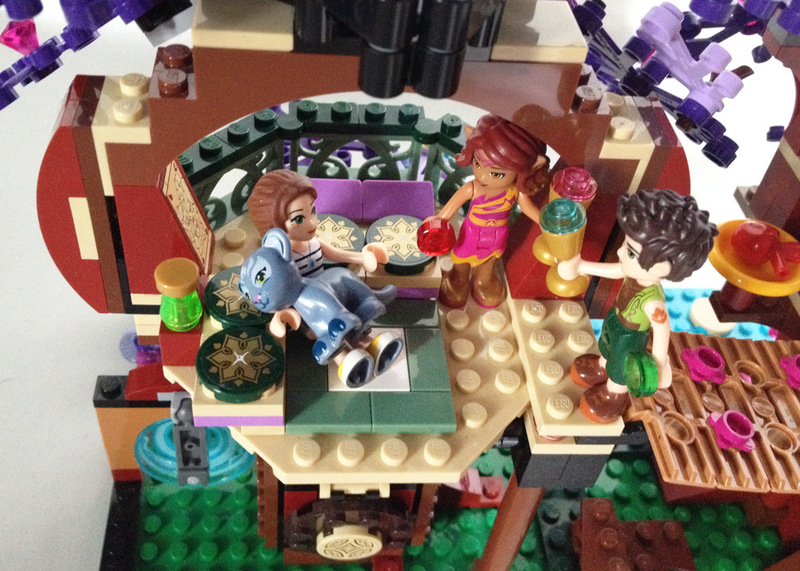 What’s more, most of the set’s play scenarios are not especially linear or scripted (a criticism often leveled at LEGO play themes in general by parents). It may not be as fleshed out with livable detail as a LEGO Friends dollhouse, but it is a great starting point for fantasy adventures in Elvendale, and a reminder that even adventurous heroes and heroines like the LEGO Elves deserve a place they can call home. That’s a lesson I wish other themes like LEGO Castle would take to heart! 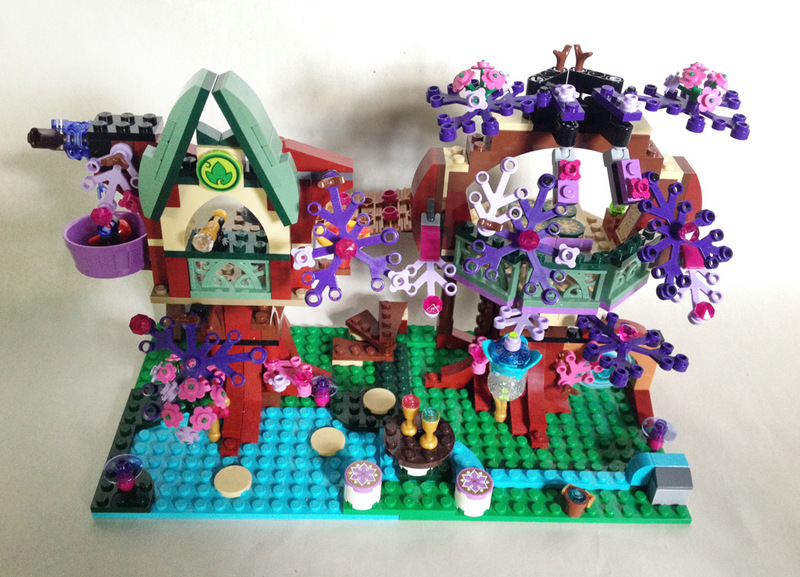 Our thanks to the LEGO Community & Events Engagement Team for providing this set. 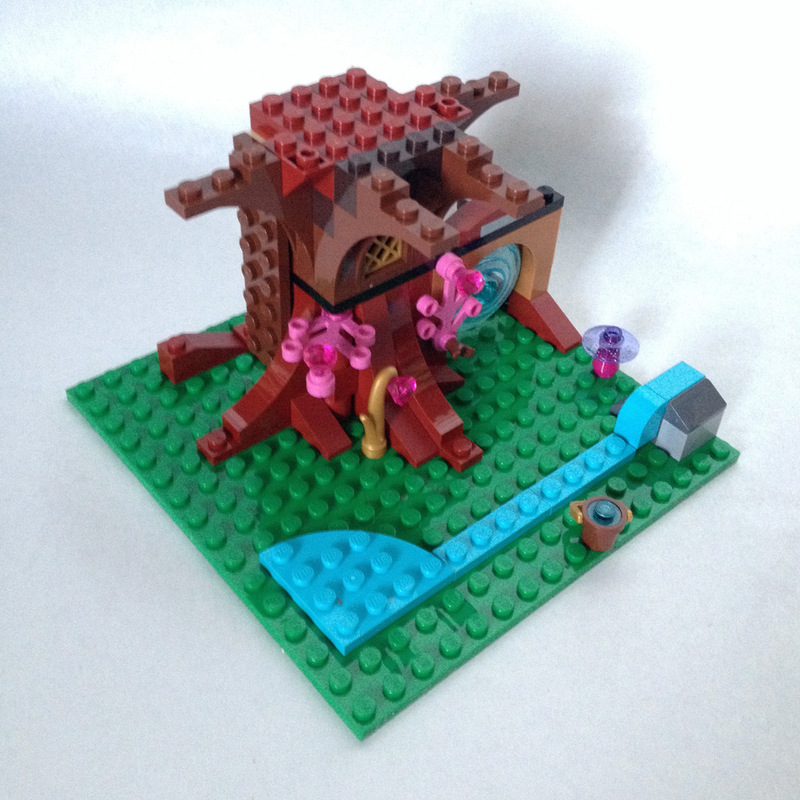 41075 The Elves’ Treetop Hideaway retails for £39.99 / $49.99 / €49.99. Consider using our affiliate links to buy it (or anything); this helps support New Elementary! I ought to mention that since I wrote this review, Enki the panther cub has finally made his animated debut in Crib Notes, the third of the three-minute filler webisodes that have been posted to LEGO.com. Wow! I LOVE the printed Tr. Light Blue 4x4 radar dish (Design ID 20939 | Element ID 6110077)!! It can be used for so many different things, my mind is spinning! A whirlpool! A microscale hurricane! Some crazy hypno-glasses! It's great! Yeah, it's a great year for spiral-shaped portals, that's for sure. Ultra Agents has introduced three different designs in Tr. Bright Bluish Violet [TLG]/Trans-Purple [BL] with a more chaotic, lightning-filled look in the sets 70170 UltraCopter vs. AntiMatter and 70172 AntiMatter's Portal Hideout. Great look at the set. Thanks. Really love seeing the new/rare parts knolled neatly. Gives a great visual aid for determining if I want to buy the set. I'm not sure about the Juniors sets, but Rebrickable says that the black 4x4 frame plate piece has appeared once in this set, once in 60072 Demolition Starter Set (which I have and can confirm it appears there), once in 60080 Spaceport, and twice in the 70804 Ice Cream Machine Lego Movie set. I wrote in the review that it "has only appeared twice previously, in Juniors and LEGO Movie sets", so those, at least, are covered. 60080 Spaceport was not yet released at the time I wrote the review. Glad there are people double-checking what I wrote, though, because I'm far from perfect and I'm sure I'll make a mistake at some point or another!